Newspaper (which one?) 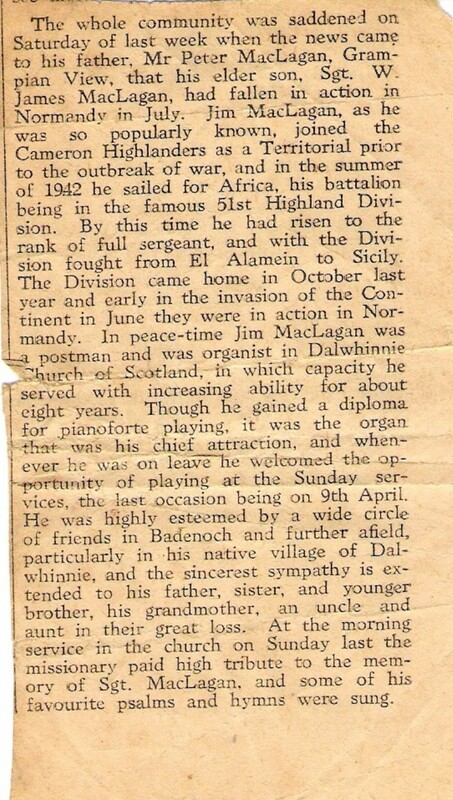 tribute or eulogy to Sgt William James McLagan, 5th Battalion "Queen's Own Cameron Highlanders", of Grampian View, Dalwhinnie. He was killed in action in July 1944 in Normandy. Buried in Ranville Cemetery beside other fallen comrades of the "51st Highland Division". Honoured on Dalwhinnie Cenotaph. Brother to Mary Christie and the late Charlie McLagan. His Grandmother was Grannie Craib, his Uncle Davie Craib.